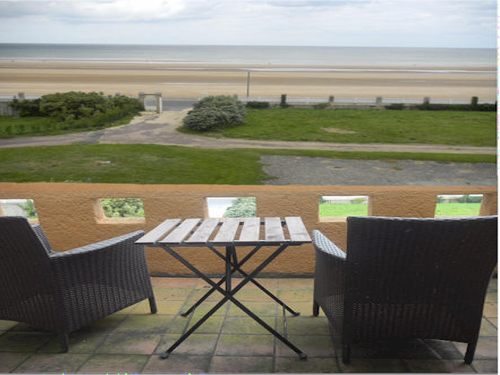 Incredible sea view from almost every room. Fully equipped, updated eat in kitchen, large living room with open fireplace, formal dining room, T.V. room with large screen T.V., library/museum with WIFI. 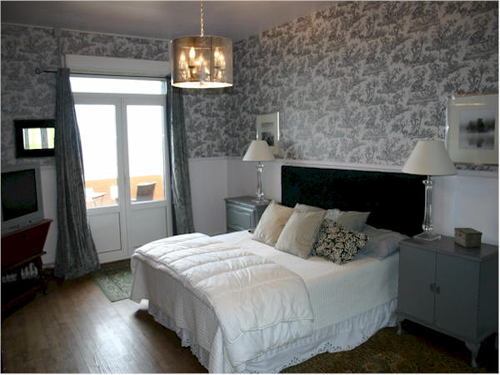 6 large bedrooms with 2 Master bedrooms, nursery off one Master bedroom and several balconies. Large yard with secluded back patio. 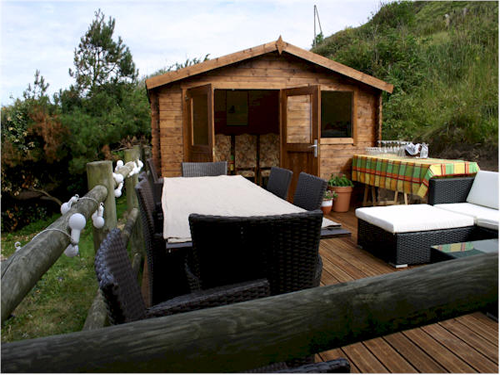 Large raised deck with sea views and party cabana. 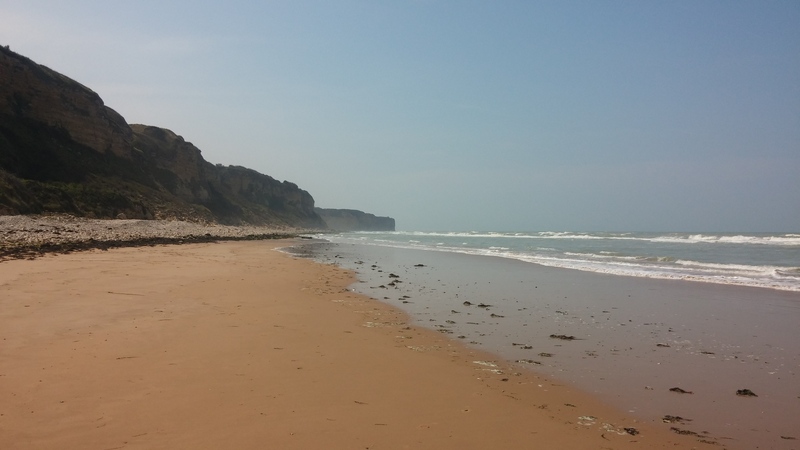 Ideal for sea lovers or for putting yourself directly in a piece of D-Day history. 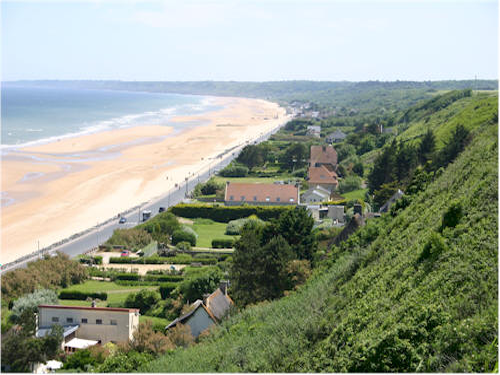 A historically protected house right on the beach at Vierville sur mer, Normandy, France, nick named during WW11 as Omaha Beach. The home is in the Dog Green sector. 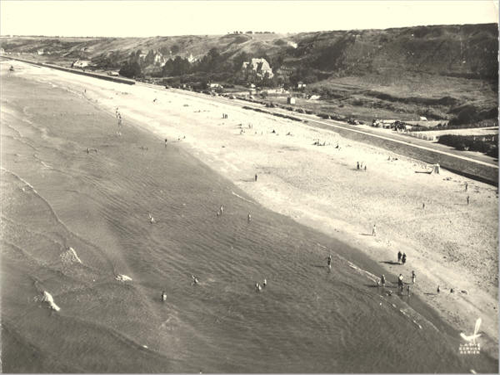 Dog Green beach was portrayed in both movies Saving Private Ryan and The Longest Day. 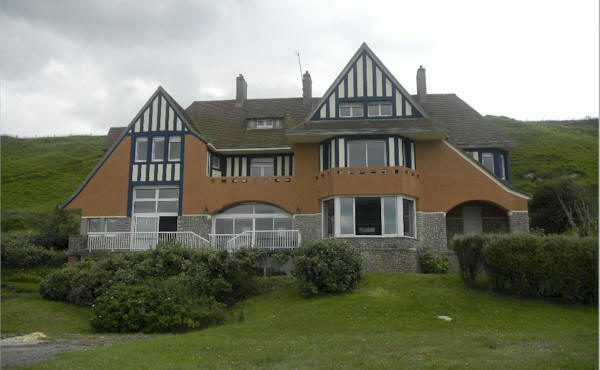 The house was standing, unoccupied, on the beach front during the D-Day landings and managed to remain with only some roof damage, quite a bit of damage to the fence and some bullets imbedded in the walls of the building. 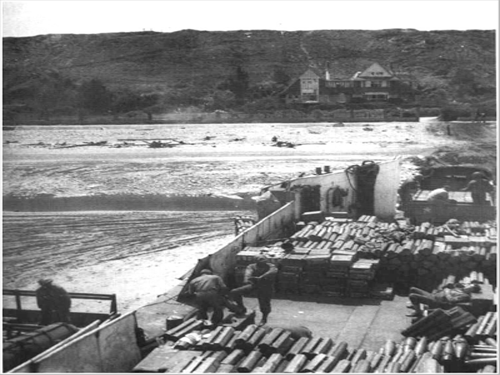 On the top of the hill to the left side of the first picture was the German position WN70. WN stands for “Widerstandnest” in German and in English the “Resistance Nest”. At this position the German’s had a 75 mm gun in a pill box and another 75 mm gun, 4 tobruks with MG’s, 2 mortars in concrete emplacements and one 20 mm flak gun. 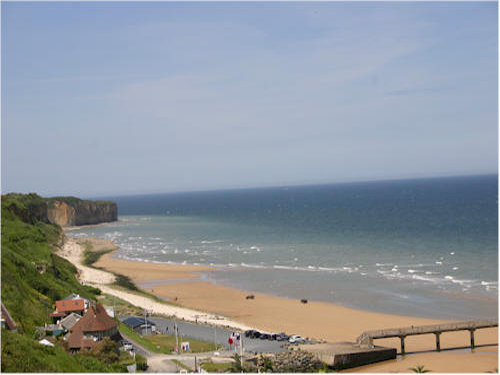 This position was taken by the American’s on the morning of D-Day. The house was built in approximately 1907 and then had a larger addition and major renovations added in approximately 1920. The house is over 4500 sq. ft., it is 4 stories, 9 bedrooms (only 6 bedrooms available for renting) with very large public rooms. 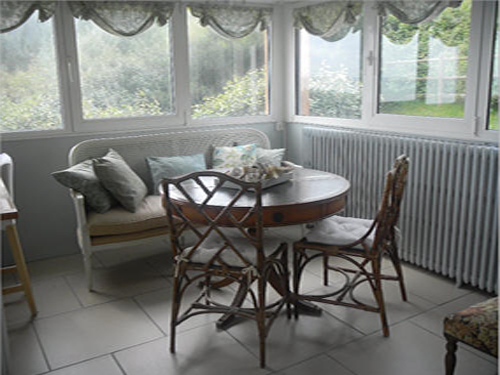 It retains the quirky charm of an old French villa but has had been fully renovated in 2015. Stand right in the spot that the Americans invaded and the German’s defended. The Floor and Room Details are shown below. 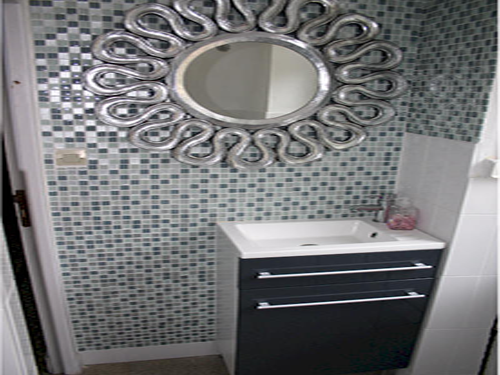 If you see the details of everything you can easily understand how much attractive service we are providing. 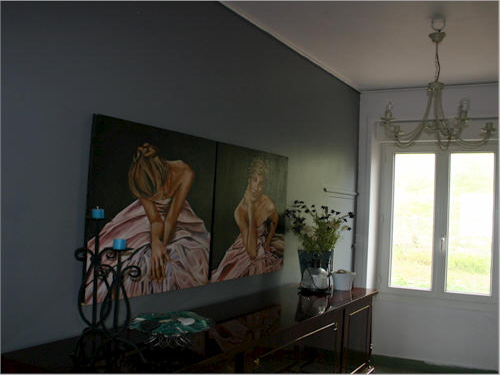 The salon is a very large room, with a 10 foot cove ceiling and fabulous views of the sea from the very large bay window. 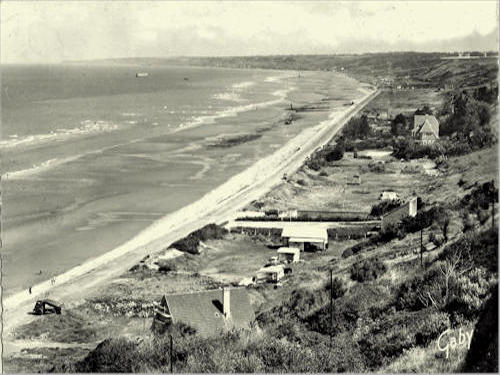 You will be able to see the sea from 90 degrees to the north, east and west. 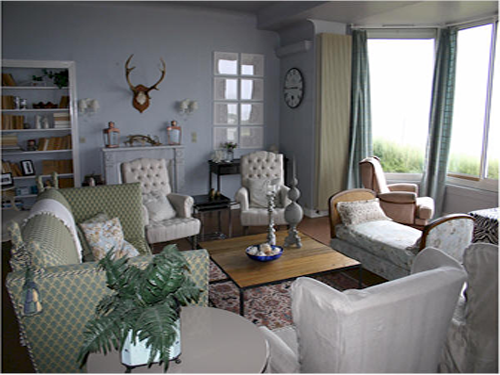 Two very comfortable chairs are strategically placed at the window for the best views in the house, and a lovely place for an afternoon tea and a cozy read or a glass of wine at sunset. The room is very bright and sunny. It has a working marble fireplace, built in bookcases with many books to read and shelving, large doors with access to the main foyer. There is plenty of comfortable seating so you can enjoy your family or company and enjoy the views or the fire. Lovely views of the sea while dining. An extremely large kitchen with 16 foot ceilings. 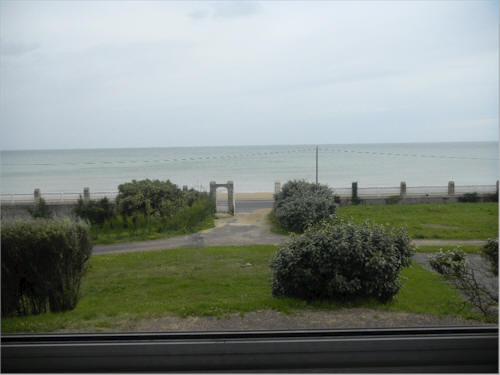 Fabulous views of the sea through 12 foot windows and French doors. 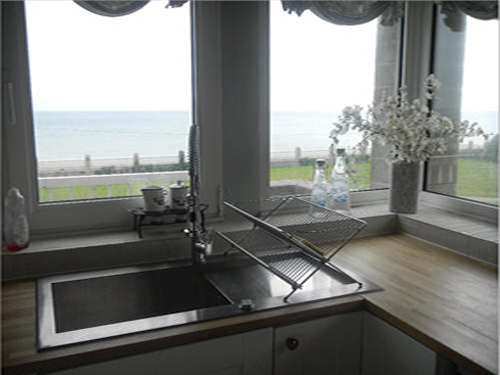 Also fabulous views from the sink and washing area along with views from the breakfast nook. 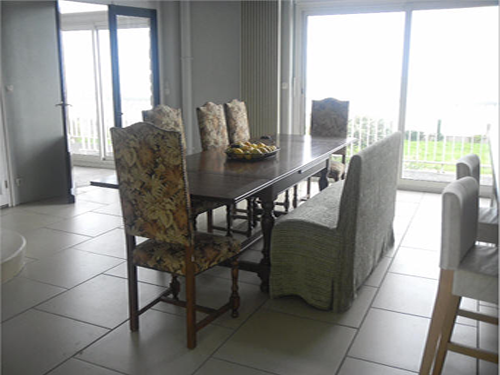 At the back of the kitchen is patio doors and a window cross through to the outdoor BBQ and the patio furniture. In addition to the patio there is a large elevated deck with a party cabana. A beautiful view of the hilly countryside. The kitchen has a staircase to access the basement level and a staircase to assess the second floor, French doors to the dining room. 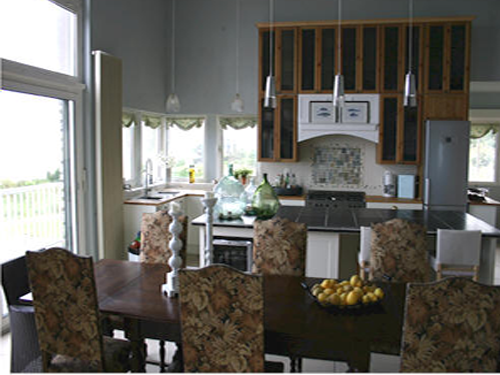 The eat in kitchen seats 10 at a large table and has an additional comfy breakfast nook. It comes with a full stainless steel fridge and freezer, a stainless steel dishwasher, stainless steel wine fridge, wine rack, and plenty of storage, including a pantry. Butcher block countertops, slate tiles for island and backsplash. A very large island with eating area, a desk area in breakfast nook. 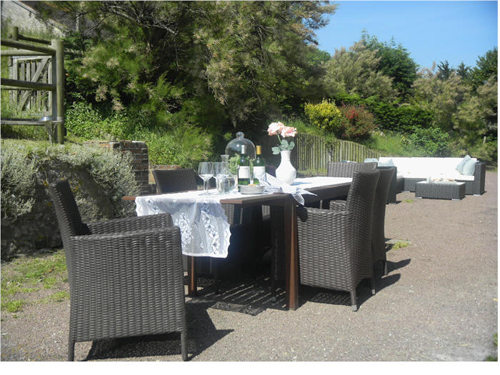 Also a large stainless steel gas stove and oven, stainless steel microwave, coffee machine and a recycling area. 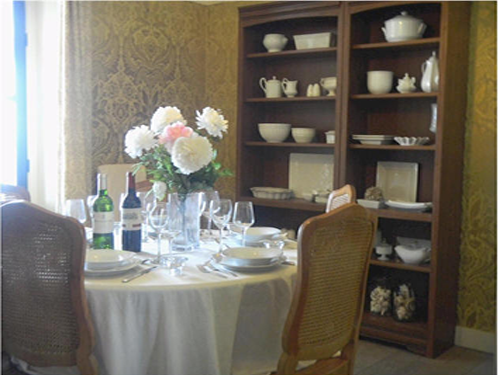 The kitchen is fully equipped with every needed appliance, from food processor, blender, to fondue set along with cookware and dishes for full gourmet cooking. 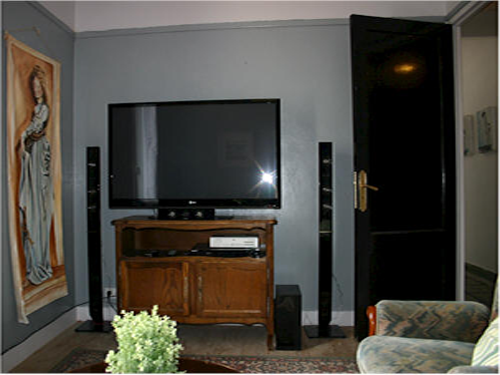 The television room is located on the main floor. 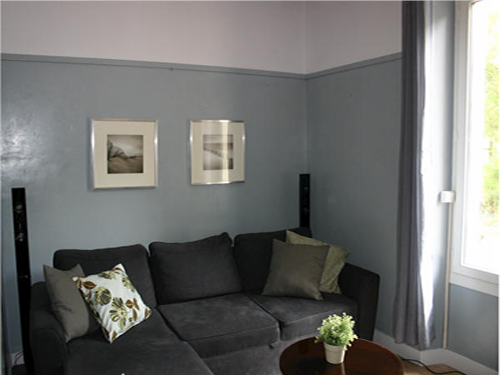 It comes with a sectional sofa that can be pulled out to a double bed. There is a 50″ wide screen television along with United Kingdom satellite television. There is a full surround sound system in this room making it a perfect theatre room. It comes also with a DVD and Blue Ray player, movies for viewing and also a stereo system with available music. 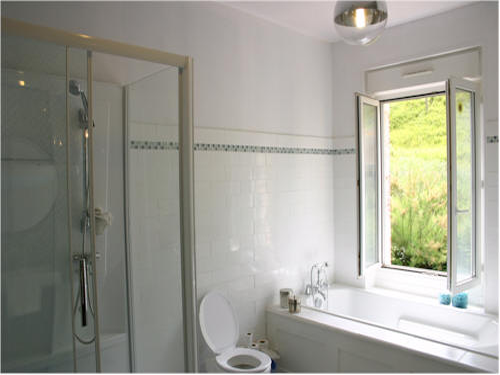 A twin bedroom located on the main floor level with an attached ensuite bathroom. This bedroom has views of the sea. 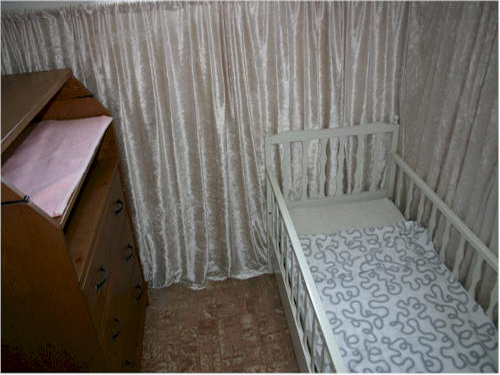 Two twin beds (90 cm), a chair and dresser. This bathroom has a bathtub and sink. 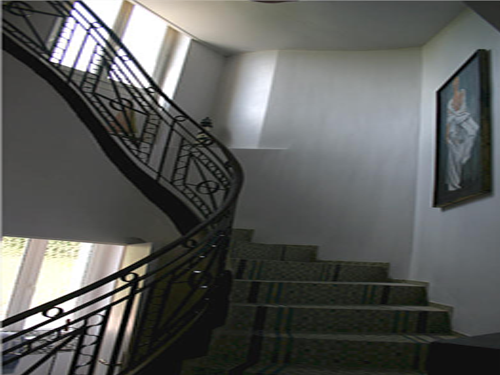 Beautiful original mosiac tiles on the floor and stairs and a wrought iron banister leading to the second and third floors of the house. Also a cloak closet and bathroom are located off this foyer. Tub is off the twin bedroom Edward, comes with a sink and tub. Washing machine and dryer. There are also a moveable clothes lines if you don’t wish to use the dryer. Two sets of large stairways to the upper levels and a large foyer. as luggage and beach toys. 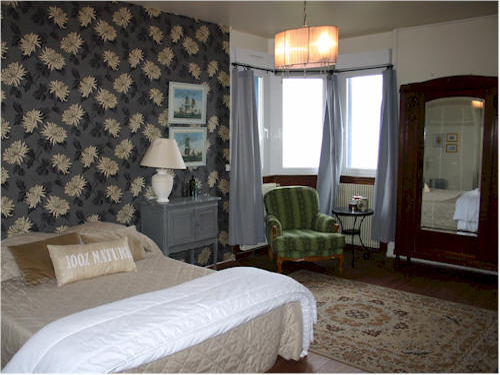 Located on the second floor, the large master bedroom has 10 foot ceilings, French doors to a balcony with outdoor seating that faces the sea and another window facing the hilly countryside. Beautifully decorated in black and white. 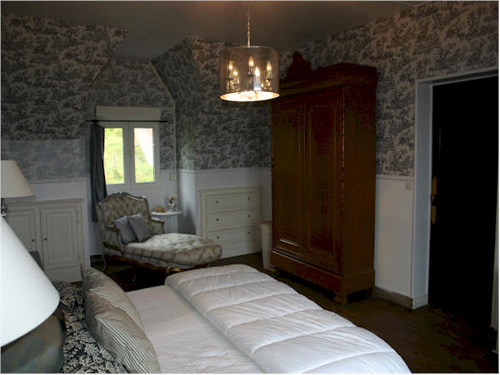 A king-size bed (180 cm) with a comfy lounger (not pictured) built in dressers, bedside tables, chandelier and lamps, a large armoire for clothing, a cabinet and T.V. with DVD player. Lovely original hardwood floors through out. Enjoy your morning coffee out on the balcony or a late night brandy. 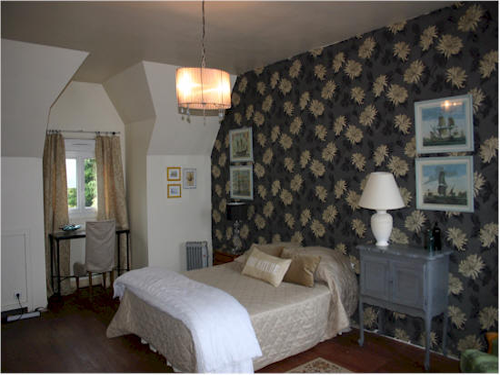 Also located on the second floor is another large master bed room. 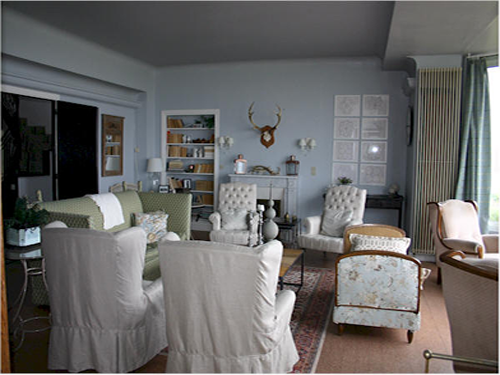 Decorated in calming beiges and grey with 10 foot ceilings and the original hardwood floors. 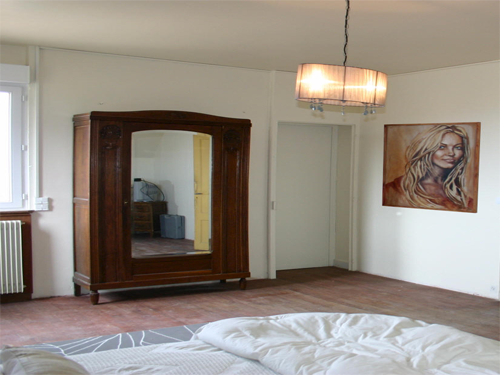 With a queen size bed (160 cm), end tables and a dresser with chandelier and lamps. Large mirrored armoire for clothing, 2 comfortable chairs and small table for lounging and reading. 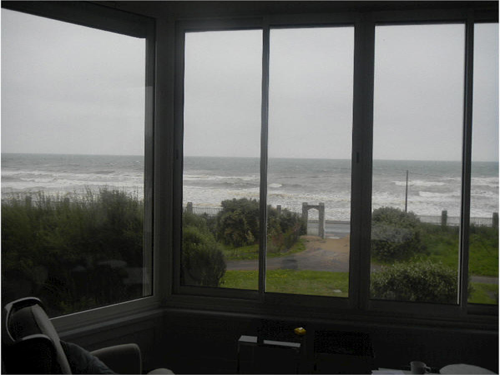 A bay window facing the sea and another window is facing the hilly countryside. Also off of this room is a small nursery. A walk in closet converted to a small nursery with crib, change table and chair. Located off second master bedroom James. 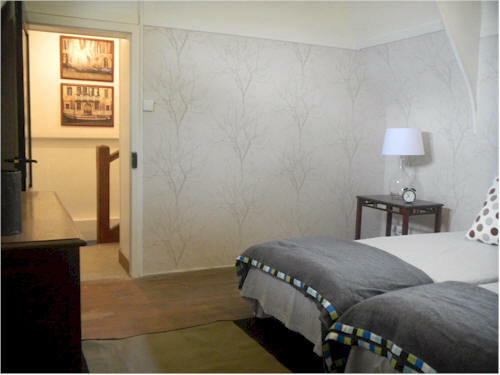 Also located on the second floor is another bedroom with a queen size bed (160 cm). 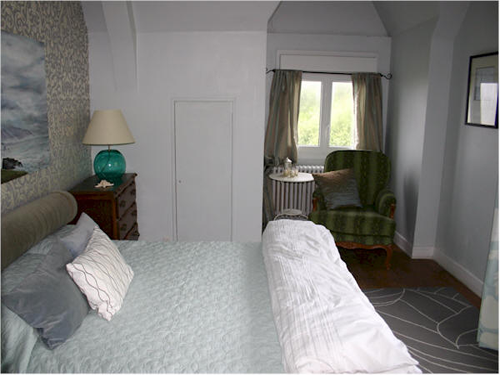 Decorated in greys and pale blue grey with 10 foot ceilings and the original hardwood floors. A comfortable chair for reading. 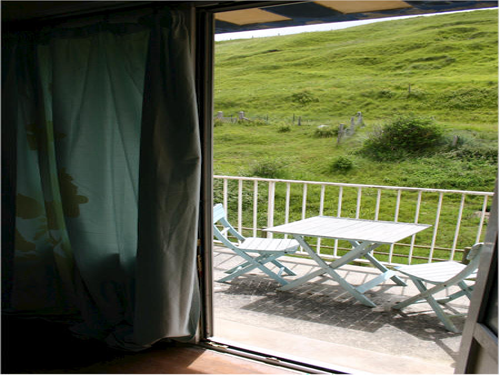 This room has large French doors with a balcony overlooking the hilly country side with a view of the grazing sheep, along with a table and chairs. Another window gives you lovely views of the sea. 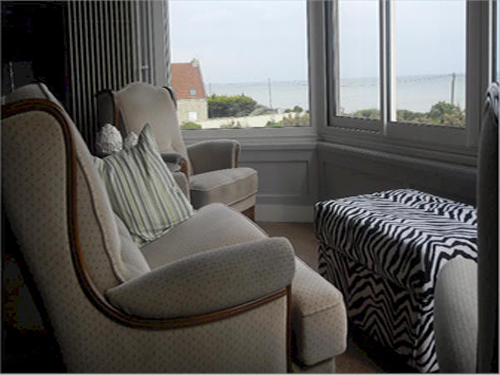 Located on the second floor this large room is wonderfully bright with many large windows and plenty of sea views. 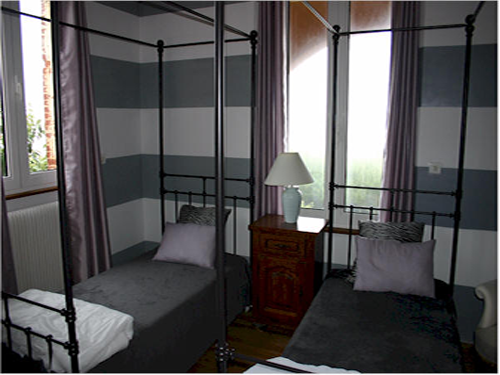 The room has a twin daybed (90 cm) and a full size bed (120 cm) which can sleep 3 children or two adults in comfort. 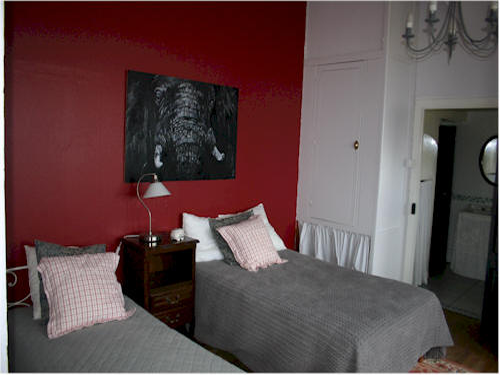 This room is decorated in reds and greys and comes with plenty of storage. This bedroom is off the shower room. Second floor shower room, servicing both Mary and Katherine bedrooms along with the 6th bedroom William located just up the stairs from this bathroom. 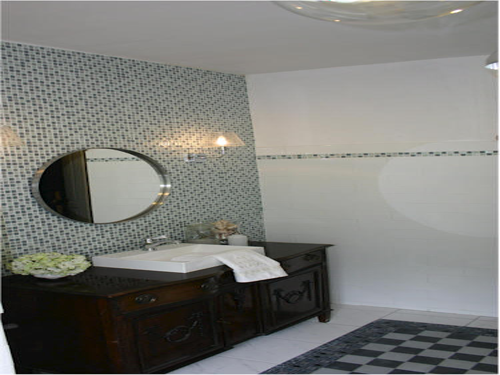 This bathroom is attached to the bedroom Mary and is just outside of the bedroom Katherine. 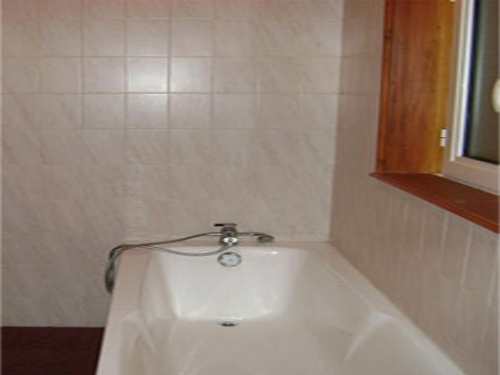 Comes with a shower, toilet and sink. 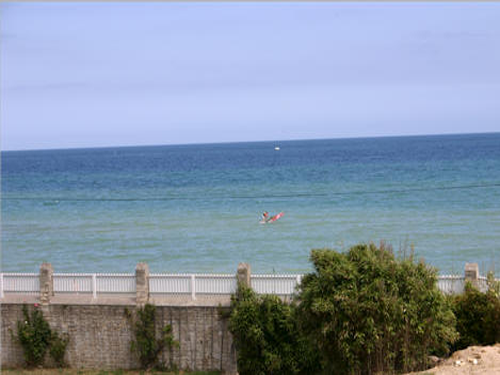 Views of the sea. 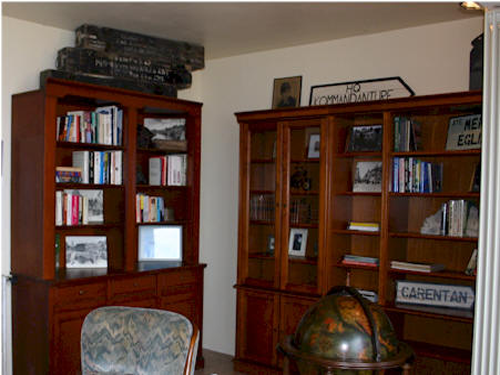 Located on the second floor directly on top of the salon is a large library or office. 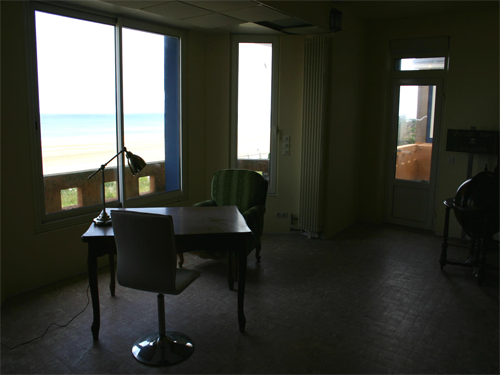 A desk located in the large bay window affords lovely 90 degree views of the Normandy sea a D-Day beaches. With a sofa, coffee table and chairs a place to escape from the crowds. Working has never been made so easy. 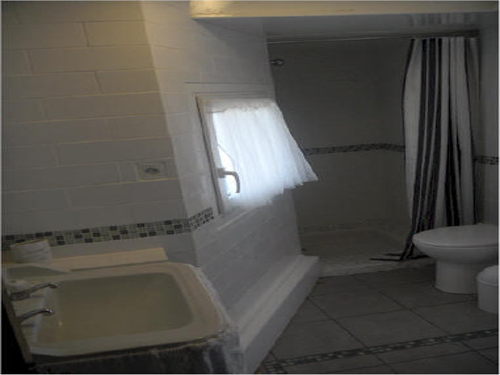 On the second floor is a large full bathroom with a large soaker tub, a separate shower, a sink and toilet. 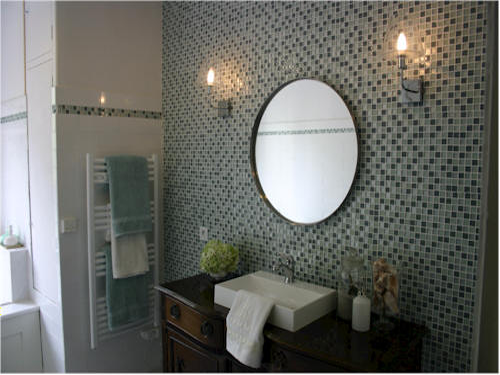 This bathroom can be locked off and become a part of the main Master Bedroom Suite. Upstairs landing and hallway with storage. 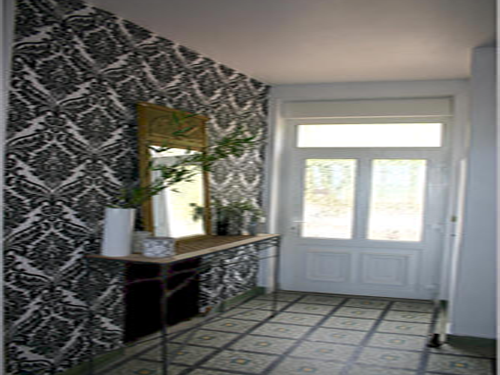 Off of this hallway is an additional toilet room and a full bathroom. A large linen closet and clothes closet are located in the hallway. Another two piece bathroom with toilet and sink on second floor. 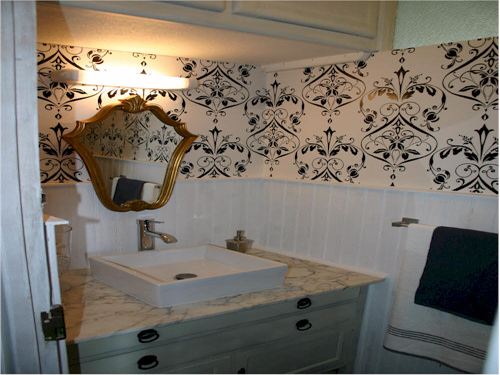 This bathroom is just outside of the bedroom James. 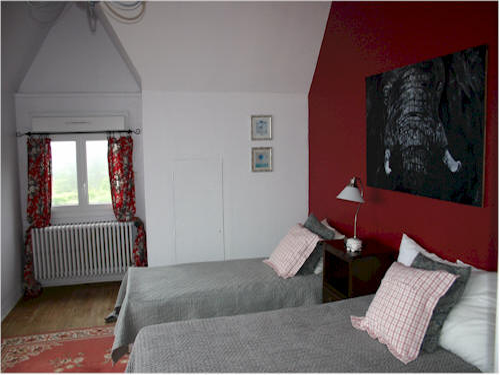 Two twin beds on 3rd floor. Small window facing the sea and another small window facing the hill.. Great for teenagers as it is more secluded than any other bedroom in the house. Comes with end tables and dresser. Info: The outdoors area has a large area for parking of multiple cars. The property is gated and is shared with 2 other owners. 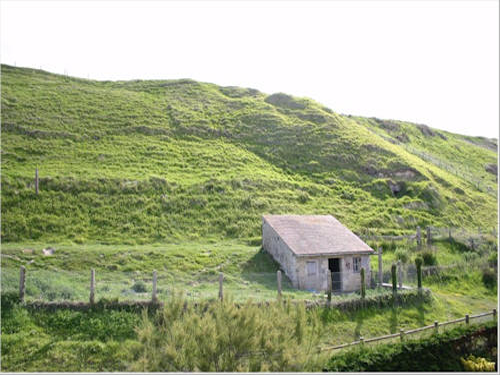 One owner has a small gite and the other owner has a lot. 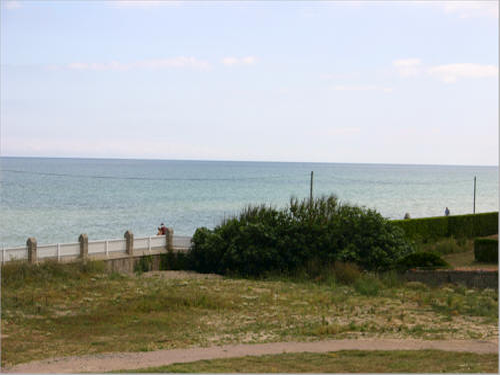 Hardelay Villa is located in the centre of this property. The secluded and private backyard consist of 3 areas, the ground level courtyard that has a large teak table and chairs along with a double bed for lounging or tanning. There is also a charcoal BBQ available for guests usage. The next area, is a lower area, down a few stairs that is enclosed by trees for privacy and to get away from the wind if necessary. This area has a fire pit (wood not supplied). 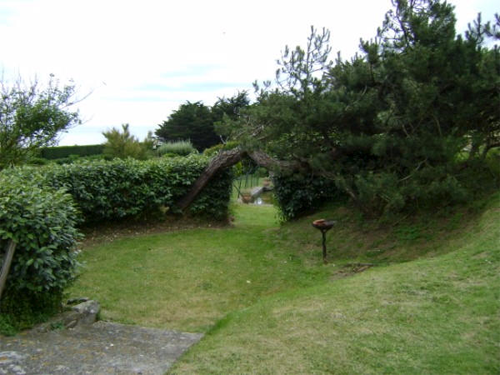 this area and has wonderful views of the sea. 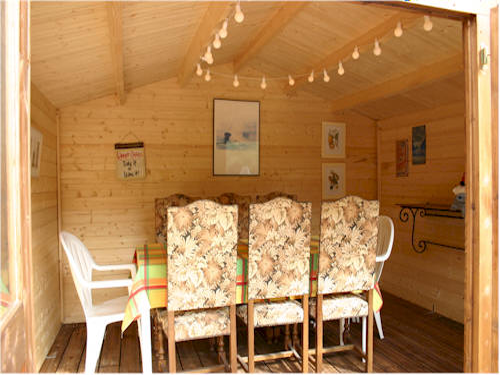 There is also a large shed (Chalet) on this deck which is set up as a dining room, for days or nights that might be raining or chillier. This allows you to still dine outside. 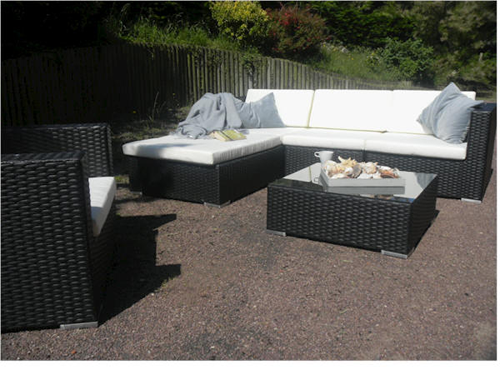 Also on this deck is located two more loungers and a sofa and chair set. Copyright 2019. All Rights Reserved by La Grand Villa Hardelay.